We have specialists on all periods from the medieval onwards, with particular strengths in the study of contemporary art, as well as experts in the history of materials and technologies. The programme begins with introductory modules in History of Art and its Objects and foundation modules in history of art, together with a thematic seminar taught mainly in galleries, museums and sites in London. You will continue with modules set mainly within specific periods in the second year, and in the final year you will select special subjects offered within the department. You will also take modules in a subsidiary subject (anthropology, archaeology, history or philosophy) to help build a solid foundation to comprehend visual culture, both past and present. In the final year you will write a dissertation, involving independent research. Students must also take a module in a modern foreign language, preferably in the first year. Further options will be selected in a subsidiary subject: either anthropology, archaeology, history or philosophy. Further options can be selected from within History of Art, and from within the same subsidiary subject as Year 1 (anthropology, archaeology, history or philosophy). You will select from a wide range of options including at least one Special Subject. Further options can be selected from within History of Art, and from fields such as anthropology, archaeology, history or philosophy. There is also the option to continue with a language (non-beginners only). Detailed course descriptions are available on the department website: History of Art BA. The programme is broad and rigorous, making graduates fully competitive for jobs both within and outside the area of visual arts. The department takes seriously the need for students to develop presentational and other skills alongside the specific analytical and interpretive skills associated with history of art. 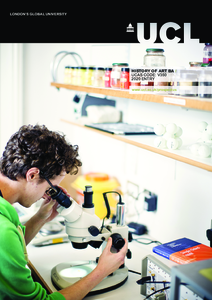 UCL's History of Art graduates have a record of success in careers in museums and galleries, academia, the art trade, the heritage industry, art publishing, art conservation and teaching. The unique combination of visual sensitivity and intellectual rigour has also proved valuable in journalism, publishing and advertising. Applicants will be assessed not only on academic achievement, but on evidence of intellectual curiosity, and of critical appreciation of visual culture.